A chat with the DC rock group about their upcoming record, It’s Real, and the many new ways they’ve found to experiment with sound. 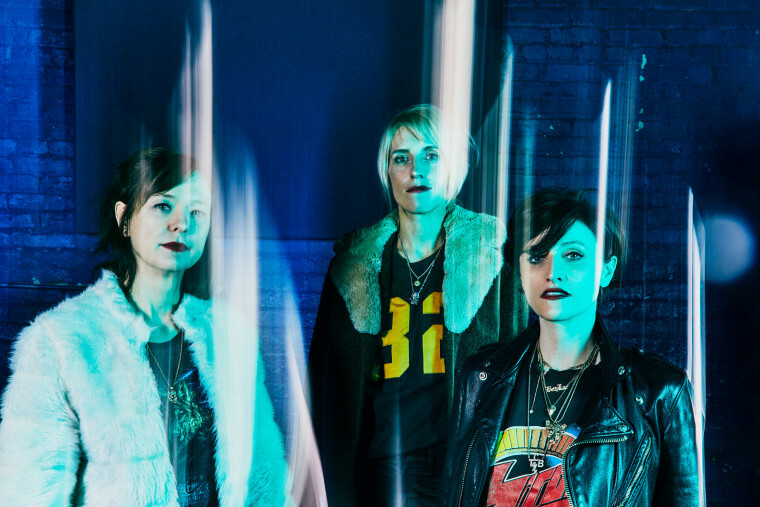 DC power rock group Ex Hex came onto the scene in 2014 with their excellent, loud debut Rips. Filled with big, raucous waves of guitar, the album embodied the type of rock ‘n’ roll that genre devotees were hungry for, which made sense; Mary Timony, founder of the influential ‘90s riot grrrl group Helium, helms the group alongside Betsy Wright on guitar and Laura Harris on drums. Today, the FADER is announcing their second studio album, It’s Real, which arrives March 22 via Merge, along with the premiere of “Cosmic Cave,” a guitar-shimmering single that Timony calls “Old style Ex Hex.” It's lively garage rock with a bittersweet swirl of a chorus and cavernous-sounding embellishments, best experienced beyond the boundaries of headphones. During a phone conversation, Timony and Wright explained that It’s Real found its form through the deliberate collaboration between the pair — their knack for continuous refinement feeding into their tightness in sound, execution, and their will to experiment. Whether it's recording with ten amps at once or indulging in the weird effects of an old ‘80s headphone amp, Ex Hex are fully devoted to crafting the best sounds for blaring at maximum volume. It’s been four years since Rips. What have you guys been up to since? TIMONY: We toured extensively — God, I would say maybe for two years. Then, we didn't have enough songs and weren't quite in the right zone to start working when the tour was done, so we did various projects. I re-released some Helium records and toured behind those. WRIGHT: I made a record with my friend Laura King in North Carolina As Bat Fangs, and we toured a lot after the record came out. TIMONY: And Laura Harris is playing in the Death Valley Girls. We just went back to normal life a little bit, then we started work on the record, which took a year maybe. We just didn't want to do it really fast, we wanted it to be good. TIMONY: Betsy or I would bring in a song idea, and then we'd sit with it and rearrange it a bunch. Some of them came out really fast. We'd play around a lot and rearrange them, and they evolved through a lot of talking. How does “Cosmic Cave” fit into the context of the new record? TIMONY: It's more psychedelic. The aesthetic we had in mind for the record was, “Sounds like another dimension.” "Cosmic Cave" feels a little bit more different — more psychedelic, a little more garage rock-y. There was some experimentation in the studio for this new album. What were some new things that you guys did that worked out? WRIGHT: Psychedelic vocal effects. On "Talk To Me," there's a flange on the vocals, which I don't think we did on the last record. On "Cosmic Cave," there's more flange-y stuff at the end. We've also been experimenting on some new guitar sounds. TIMONY: We really spread out our guitar sound as much as possible, which we didn't do as much on Rips. We tried to have a bigger variety of sounds on guitar — we even had a synthesizer on one track. We also tried to record the whole record on isolated drums, and threw that away. We experimented a lot — some of it was great and some of it didn't work, but we definitely tried a lot of things. What were some cool things that worked? TIMONY: We had this headphone amp called the Rockman that was designed in the ‘80s by Tom Scholz from Boston. I inherited one from my friend Kevin in high school and I never gave it back to him — it was just sitting in a closet, and we got it out and ended up using it after we read about Mutt Lange using it for Def Leppard's Hysteria. It just sounds so '80s. It was kind of perfect, so we used that thing as much as [we could]. We didn't actually use it that much. WRIGHT: But when we did, it sounds really satisfying. TIMONY: It felt wrong, but it felt right at the same time. Are there any new groups or people that you guys have been following or have been giving you guys inspiration? TIMONY: I just saw this band Clear Channel that's really good, I don't even think they have a record yet — it's the new band from MJ from the Downtown Boys. There's a lot of people in their twenties [in DC in bands]; it's a good scene right now. WRIGHT: Flasher — they're here and I've always loved them. TIMONY: It's cool to see the Messthetics doing stuff — Brendan Canty's new project. It's nice to be a part of this community where there's people who's excited about playing rock music. Because DC died a little bit for ten years, there wasn't much going on, so it's really exciting. It's Real drops 3/22 via Merge.